Introducing a New Custom Arm Program by American Heritage. 2- seat depth options: 21" inside with a 38" outside or a 23" inside with a 40" outside. Select from a variety of arm styles to create that perfect look. Choose from a collection of skus and style options to customize your sofa or sectional suite. Standard features that you only get with American Heritage include :Seats and back pillows that are removable and velcroed together to keep from slipping around. Numerous matching pieces are available including loveseat, chair, ottoman, recliner and sectional. Durability on the inside to last a lifetime...Kiln dried appalachian hardwood, Real Eight way hand tied spring suspension, Double doweled frames, Corner block joinery, steel band reinforced. Spring-Down Cushions standard. Poly Blend Back cushions. All cushions are individually bagged, zippered, and channelled to prevent bunching of fill. Made entirely in the USA. 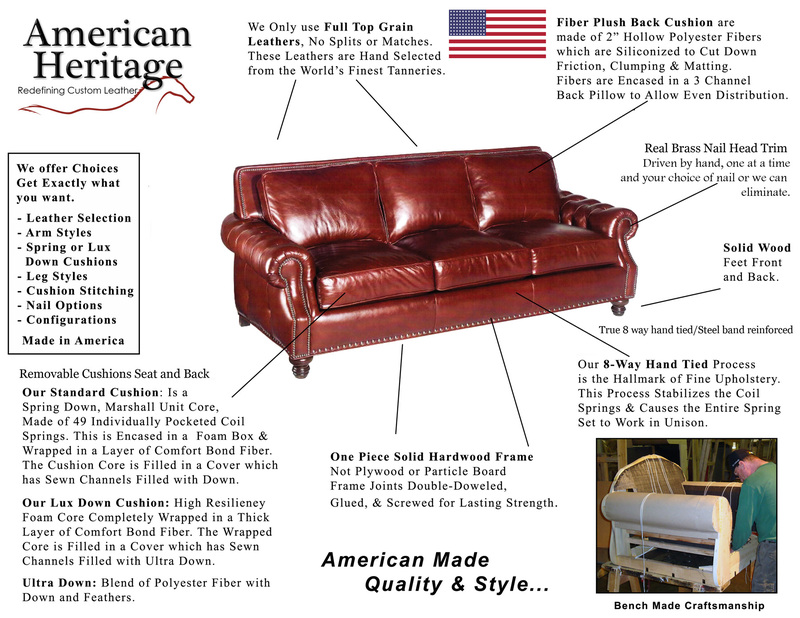 American Heritage is an American furniture company built in North Carolina. Here you will find uncompromised handmade quality. We have aligned ourselves directly with this Custom Private brand to build furniture for us at LeatherShoppes.com. What you will find, is a Feature Benefit story unlike most other products made today. Adhering to time tested production techniques including hardwood frames, that are corner blocked, Spring construction, 8 way hand tied suspension with fully padded frames, and spring feather/fiber cushion. All these details provide durability and beauty for years to come. Over 140 luxurious top grain leathers available in every color under the sun, including coordinated Tooled patterns. Making your customized lifestyle choice is easy , we've organized them all by color and price. It feels good to know you're buying furniture that's made right, and at home. A comprehensive product warranty protects every purchase. Each product reflects high standards for materials, craftsmanship and product safety. Choosing us minimizes the environmental impact of overseas importing.